Invention City Developed VertiGrille™ and Will Now Be Making and Selling It Too. Invention City is in the process of launching a fantastic new product called VertiGrille™. It came about when Dan Fulford's sons showed him a bent up fireplace grate from Wal-Mart used to cook hot dogs by a campfire. Dan saw potential in the idea, spoke to our lead inventor Joel Marks and voila, a new product concept was born. The premise behind VertiGrille™ is simple and obvious. 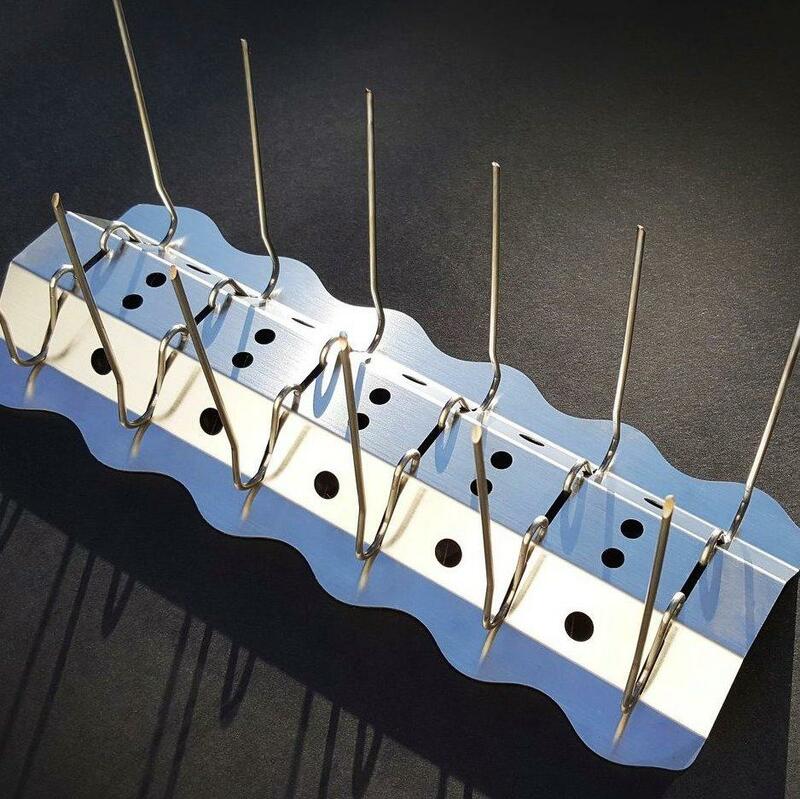 Putting food on vertical skewers enables a grill, oven, bbq or smoker to cook more food than a horizontal orientation. This basic idea was known in prior art. But the problem of designing a product at an attractive price that's both easy to use and easy to store needed to be solved. That's what Joel did. He came up with a two part system that we believe is the best performing, lowest cost design for a vertical grill (non-provisional patent pending). Joel made a first prototype and sent it to Dan who made a rough video with his smart phone. Dan contacted people we knew in the world of direct response television and promptly heard "no." He contacted grill companies and heard maybes that turned into noes. Then we had a hit with a major brand that sells cooking products and entered into licensing negotiations with them. We had an acceptable offer on the table with regard to royalty rate, royalty advance and annual minimums. But there was a clause they insisted on that would have had us defending them against charges of patent infringement for design changes that they made, changes we had nothing to do with. We walked away from the deal and decided (pending confirmation) to go forward on our own. To confirm customers we needed to estimate a selling price and to determine a profitable selling price we needed to know the product cost. This meant sourcing manufacturing. VertiGrille™ has two types of parts, a stainless steel base and a set of 6 double skewers. Those parts are made by different types of machines operated by different manufacturers. We sent out request for quotations (RFQs) to both existing and new contacts in China and USA. The new companies were found by google searches for "metal stamping" and "wire forming," looking for companies at Thomasnet.com and registering at mfg.com (highly recommended). US sources offered costs similar and even better than China, albeit with higher tooling costs. Now that we knew what VertiGrille™ would cost, we could settle on a desired retail price and perform a survey to find out if people indicated they would buy it. But to ask the question if they would buy, we needed to show prospective customers what the product is. For that purpose we made a video that could be showed at the beginning of the survey. The video would also be useful for when we went to market. The survey results were not as good as we had hoped, but they are good enough for us to proceed. Having re-confirmed the costs with our manufacturers we are now beginning tooling and plan to ship product by June 1st. We'll be running a sort of modified crowdfunding campaign here at InventionCity.com in the form of accepting pre-orders. Pre-order customers who buy two or more VertiGrilles™ will get a third one for free. The patent potential for Joel's design looks strong and we believe that the structure claimed in the patent is critical to the benefits of the product. In short, we may have competitors, but we believe our product will be regarded as far superior and that will mean our profit margins can be maintained. The offer to pre-order VertiGrille™ will be live this coming week. Our fingers are crossed.